For years, astronomers thought that a galaxy floating 100 million light-years away was a single celestial object, a perfectly on-edge spiral galaxy with a colossal jet streaming away from it. But it's all just an optical illusion — and a rather massive one at that. In a statement released by NASA yesterday, the space agency conceded that, "New data from the National Science Foundation's Karl G. Jansky Very Large Array (VLA) reveal that two galaxies, one lying behind the other, have been masquerading as one." The closest of the two galaxies, the spiral UGC 10288, is 100 million light-years away. But behind it, at the astonishing distance of 7 billion lightyears, is a partially obscured galaxy that's shooting two giant jets — but only one can be seen. 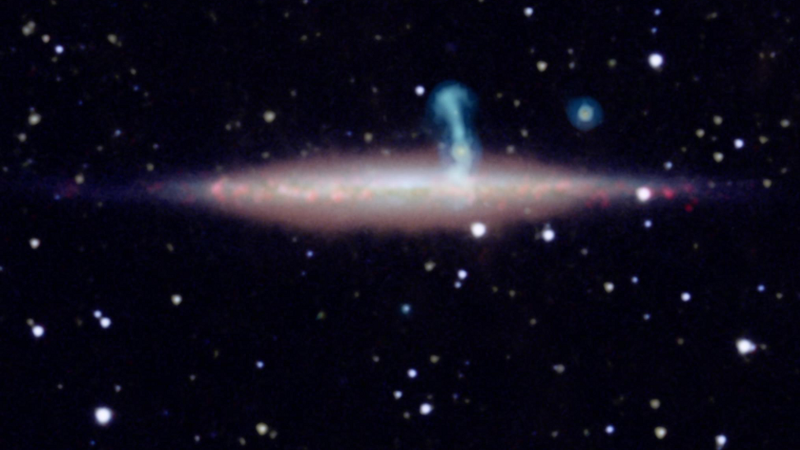 The arc-like feature rises more than 11,000 lightyears above the disk. Previous radio images of the two galaxies made it look like one fuzzy blob, fooling astronomers into thinking they were looking at one galaxy. But thanks to the VLA, the scientists can now peer behind this galactic veil. Measurements made by Spitzer and WISE revealed new structures above and below the plane of the closer galaxy's disk. "We can use the radio waves from the background galaxy, coming through the nearer one, as a way to measure the properties of the nearer galaxy," noted Canadian astronomer Judith Irwin in the NASA release. She is the lead author of a recent paper on the findings, which now appears online in the Astronomical Journal. Image credit: VLA/NASA/JPL-Caltech/SDSS/NOAO/University of Manitoba.